Mouquet Farm is just north of Pozieres and it serves as a German Brigade Headquarters and a strongpoint defended by two companies in a maze of bunkers and machine gun posts. Its importance as a British objective lays in the fact that it flanks Thiepval Ridge. Mouquet Farm (Mucky or Moo Cow Farm to the troops) will be the scene of heavy fighting from today until 3rd September. Royal Fusiliers (36 Brigade 12th Division) are holding Ration Trench. At 04:00 a German attack from the north east with grenades and flame-throwers drives the Fusiliers out of their trench. Fighting in the open they prevent any further German advance. Private Charles Herbert Righton (Royal Fusiliers) is killed in action at age 21. His brother will be killed serving in the same regiment in November of this year. Private Albert Edward Willans (Royal Fusiliers) is killed at age 17. His brother was killed in May 1915. At Pozieres in the early morning 5 and 7 Brigades (2nd Australian Divsion) are relieved by the 45th and 48th Battalions of the 4th Australian Division. A German attack from Courcelette is driven back. South of the village, in the afternoon, the 8th West Yorkshire Regiment capture another 150 yards of Munster Alley from the Germans. They also secure the eastern end of Torr Trench. Fighting continues all night with 11th West Yorkshire fighting through the 8th in conjunction with an Australian attack. In Egypt the enemy is found to have retired from Qatia, and, while the cavalry press on in pursuit, the infantry moves forward and occupies the line Er Rabah-Qatia-Bir El Mamluk. Australian Light Horse, which have borne the brunt of observing and harassing the enemy’s advance, are given a day’s rest in camp, while the remainder of the cavalry continue the advance. The enemy’s rearguard is found to be occupying his previously prepared position extending across the road and telegraph line between Hod El Reshafat and Hod El Dhaba. British attempts to turn their flanks by Hod En Negiliat on the north and Hod El Sagia on the south are frustrated by heavy artillery fire. On the same morning the Camel Corps detachment of Smith’s Mobile Column occupy Bir El Mageibra without opposition. Another body of mounted troops also moves to Mageibra in support at Bir El Jafeir. In the afternoon Major John Julius Jersey de Knoop, commanding the Camel Corps detachment of this column, reconnoitres towards Hod El Bayud, and reports that a force of the enemy is occupying Hod El Muhammam, five miles north-east of Mageibra. Orders for an attack next morning are issued by Colonel L C Smith VC. The hired trawler and minesweeper John High (Skipper John High) strikes a mine and is sunk off Mt. Sozonova Murman coast in the Barants Sea killing fourteen of her crew including her skipper. The only survivor is the mate who is standing on the bow with his life belt on when he is blown over board and rescued by another trawler suffering only shock. Captain John Alexander Kennedy (Seaforth Highlanders) dies of wounds at age 37. His brother will be killed in May 1917. Private Ernest John White (Dorsetshire Regiment) is killed in action. His brother will be killed in August 1918. Rifleman Alfred Herbert Burtt (King’s Royal Rifle Corps) dies of gunshot wounds at Etaples at age 30. His wife was with him when he died and he was the Scoutmaster for the Apsley Troop. Private Adam Beaton (Cameron Highlanders) dies of wounds. His brother will die of wounds October 1918. Private George Henry Creber (Devonshire Regiment) is killed at age 26. His brother was killed at the Battle of Jutland. Private William Baldwin (Australian Infantry) is killed at age 23. He is the first of three brothers who will be killed in the Great War. Trooper George Rawdon ffrench Nobbs (Australian Light Horse) is killed at age 20 in Egypt. He is the son of the Reverend George Rawdon ffrench Nobbs. Private Leonard Haigh (Army Service Corps) dies on service at home at age 35. 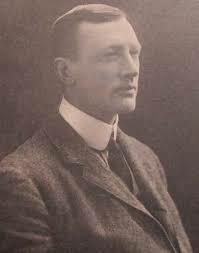 He won seven caps playing Rugby football for England in 1910-11.